The international program titled "winter school for students and fresh graduates of process and petroleum engineering" on 4-13 February 2019 in Persian Gulf University (PGU). 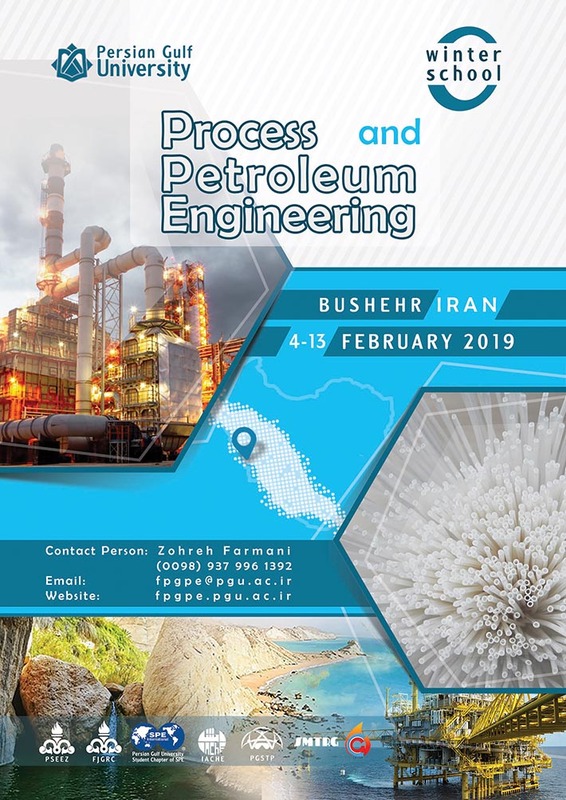 The objectives of this program include, but not limited to getting introduced to novel techniques and technologies in process and petroleum engineering, potentials, activities, capabilities and scientific achievements in PGU, visiting selected giant gas and petrochemical plants in Iran, as well as cultural tours to historic cities of Bushehr and Shiraz. This program is planned for international students and fresh graduates of chemical, process, and petroleum engineering. The cost of program is 500 Euros paid by cash upon arrival in Bushehr and includes registration, accommodation, food, course materials, central laboratory, Shiraz and Bushehr city tours, entrance tickets for historic and cultural places, and transport inside Iran (Bushehr, Assaluyeh, Jam, and Shiraz). However, it does not include the visa and flight costs. For more information, please see the enclosed poster.